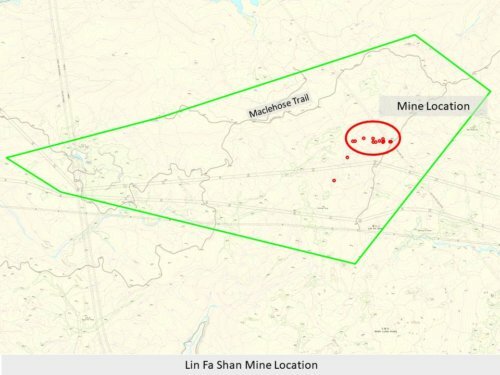 When Tymon Mellor sent this revised version of his original article on Lin Fa Shan Mine, first posted in November 2014, he suggested it was more a complete re-write. 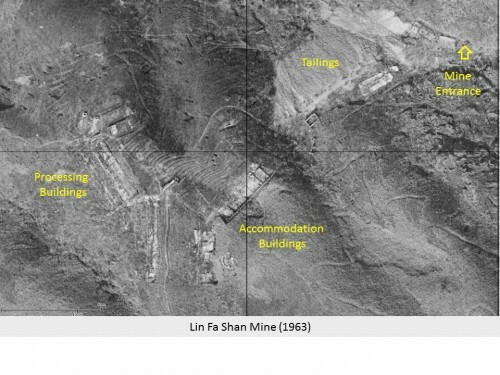 Tymon Mellor: The Lin Fa Shan mine is located in a remote area of the Tai Mo Shan Country Park, on a steep west facing slope of Lin Fa Shan, just above the abandoned village of Sheung Tong. The surrounding hillsides are covered with shallow excavations, representing past searches for Wolfram, the natural ore of Tungsten. In addition to the licenced mine, thousands of miners undertook illicit operations until a hardening of the Government’s approach closed the small workings, and a drop-in ore prices made the licenced mine un-economic. 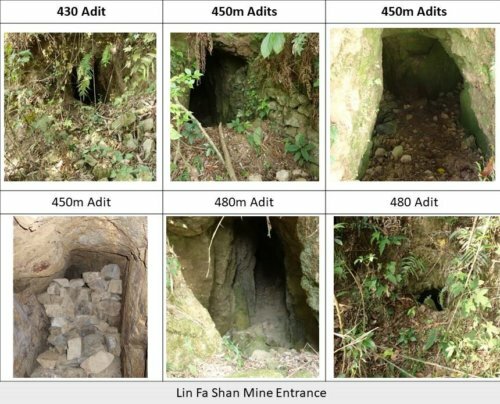 This article discusses the abandoned mine workings at Lin Fa Shan. These workings are extremely dangerous with unsupported tunnels, open shafts and no maintenance since their closures in 1957; the workings should not be entered. Lin Fa Shan forms one of the foot hills of the Tai Mo Shan range, composed predominantly of granite, and the natural rock formation is crossed by a number of ore bearing quartz veins, in this case Wolfram. In the early 1950s, there was a world shortage of Tungsten due to the demands of the Korean War, and compounded by the stockpiling of minerals by the US government. This resulted in a significant jump in mineral prices making ore extraction a profitable industry, proceeded by the price dropping by the end of the decade as demand withered. In Hong Kong, with a growing pool of new immigrants and limited job opportunities, mining became a growth industry overnight. Within days of the discovery becoming public, thousands of people made their way to the hillside to mine their fortune. 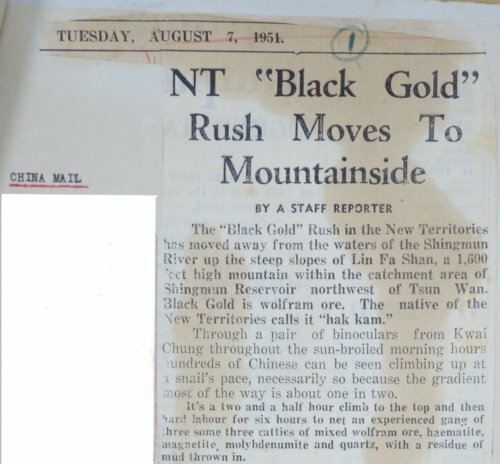 The first indication that Lin Fan Shan would be an important mining area came on the 6th January, 1948 when Mr Patrick John O’Neill, a retired Government Revenue Officer, requested a Prospecting Licence for the area. Financing for the enterprise had been arranged with up to HK$3,000,000 available to develop the mine. Although Mr O’Neill had worked for the Government for 30 years, it is unlikely the money was his own although he seemed to have developed an interest in mining. 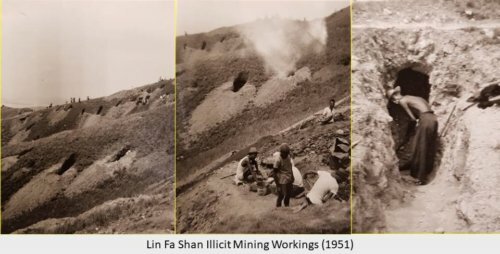 In addition to the Lin Fa Shan area, he was also issued a temporary mining licence in October, 1952 for the extraction of Galena (the mineral of lead) in the Lam Tsuen Valley. 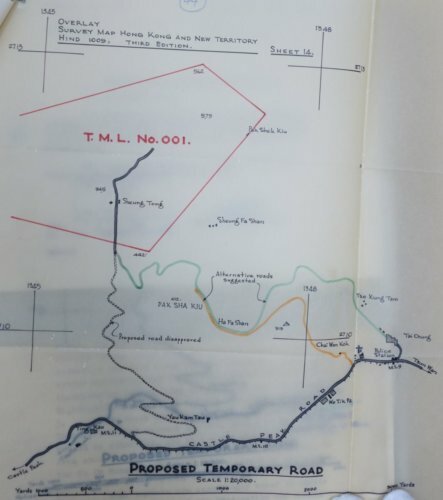 Following further prospecting in the Sheung Tong area, in March, 1948 Mr O’Neill revised the prospecting area to include what would be the area of Wolfram bearing rocks, to the east of Sheung Tong village. 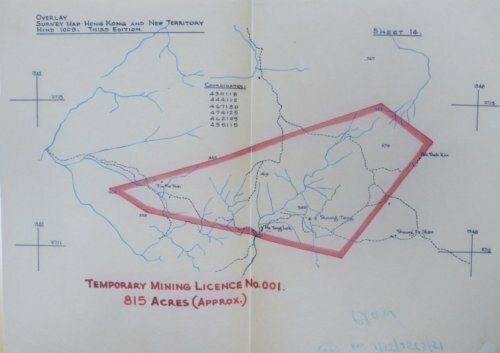 On the 14th June, 1948, the Colonial Secretary advised that it was not currently possible to issue a licence for the area as the Government was updating the mining regulations and was recruiting new staff to manage the process. In March, 1950 Mr O’Neill visited the District Commissioner for the New Territories to enquire the progress on his Prospecting Licence. Mr O’Neill was living in Tsuen Wan at the time, “cultivating an area of land in order to make ends meet”. The District Officer noted that licences had not been issued as the Government had been unable to “obtain the services of a mining inspector” to supervise mining operations. By January, 1951 Mr O’Neill had leased land in the Sheung Tong area to commence prospecting while illegal mining was being undertaken on the surrounding hillsides. A visit by S G Davis, a Government advisor on mining, reported that alluvial tin and wolfram ore was present in the area and a monthly mining permit should be issued to control the illicit mining activities. By March, 1951 the Colonial Secretary, Mr D C Barty agreed to issue a monthly permit for “open-cast or alluvial workings”. Discussion continued with the Government throughout the summer of 1951 based on an enlarged mining area of 815 acres. In October, 1951, a new superintendent of mines was appointed, Mr W M Keays, working under the Commissioner for Labour. He would be responsible for ensuring all mining operations were to be undertaken in accordance with the relevant legislation. 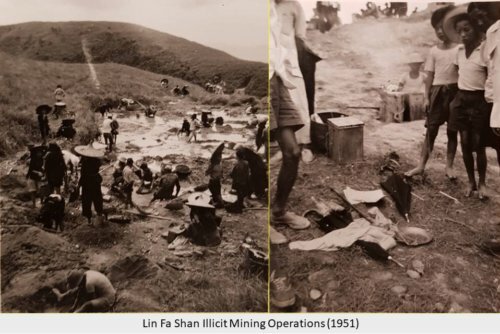 However, as a front line official, he was exposed to financial misdeeds and would ultimately be prosecuted for corruption in 1956 in relation to his activities associated with the Lam Tsuen mine working. With Mr Keays in place, a Temporary Mining Licence No. 1 was issued on the 7th November, 1951 for an area of 815 acres in the Lin Fa Shan area. With the licence in place, Mr O’Neill appointed Wong Yick Sam and Chan Yau San, trading as Ling Tong Mining Company on the 31st January, 1952 to develop the mine. The mining company recruited workers from the illicit mining operations and established mine facilities. However, as noted later by the Superintendent of Mines in October, 1952; “These contractors are completely irresponsible and incompetent”. They had taken to mining outside the allotted area, selling explosives to illegal miners, undertaking illegal mining and not following Government instructions. In a letter of the 15th April, 1952, the Superintendent of Mines noted that the “coolie lines”, workers accommodation were not suitable and that many miners were living in the tunnels. The Government threatened to shut the mine down by suspending the supply of explosives. To ensure the continuation of the mine, Mr O’Neill sacked Ling Tong Mining Co. on the 21st May 1952 and appointed the Po On Hong Company Ltd under the control of Mr Stephen Hui, a graduate of the Colorado School of Mines and a philanthropist. On the 22nd July, 1952 the sacked contractor, Ling Tong Ming commenced civil proceedings against Mr O’Neill to recover HK$700,000 invested in the mine. I have been unable to establish the outcome of the proceedings. With the new contractor in place, the Temporary Mining Licence was renewed for a further six month on the 7th May, 1952 and 7th November, 1952 and subsequently on a regular basis until 1954. With such a short lease, Mr O’Neill was struggling to raise capital and in June, 1953 requested a Mining Lease for a 21 year period. The Government was not willing to issue a Mining Lease until after the new Mining Ordinance became effective in 1954. By May, 1954 Mr O’Neill health had deteriorated due to “bladder trouble”, and he was recommended to “reside in a cooler climate”. In order to continue the mining operations, it was agreed with Government that Mr O’Neill would surrender his licence and the Po On Hong Company would take over the mine’s operation under a new mining licence in the company name while retaining the original licence 001. With the change in ownership, new capital was found to develop the mine. 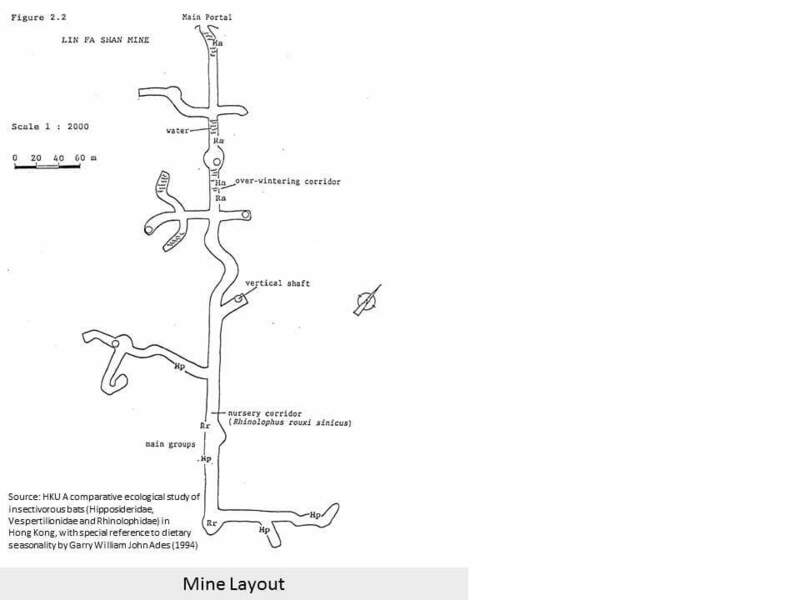 In August 1954 a request was made to construct a temporary road to the mine for the delivery of new mining equipment. The proposed route was not acceptable to the ‘Headquarters Land Forces’, but an alternative alignment was proposed for further study. Following a survey in late 1954, the “green” alignment proposed by the military was recommended for construction. It is not clear if the road was constructed, but new equipment was established at the mine. In April, 1955 Po On Hong Company applied for a 21 year Mining Lease, to be issued under the new 1954 Mining Ordinance. Based on a reduced area of 729 acres, the company paid a premium of HK$73,050 based on HK$100 per acre and HK$150 fee. 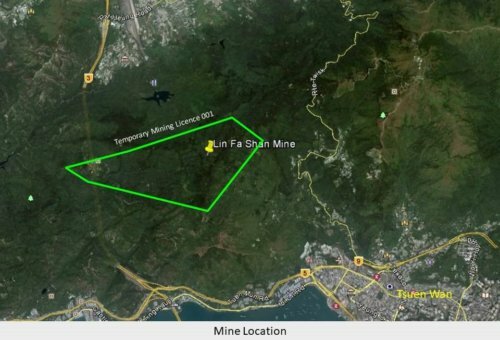 Mining at the site continued and in to the following year, with around one ton of ore being extracted which was worth around HK$13,000. However, with a falling ore price and over borrowing, the company was declared insolvent on the 24th September, 1955. Following the bankruptcy, the Official Receiver continued to operate the mining in an attempt to sell it as a going concern. By early 1957, it was clear that there was no interest in the mine and despite the extraction of 7.18 tons of ore during the period, on the 14th March 1957 the mine ceased operation and was shut down. While clearing up the company account, the Official Receiver noted that following the payment of the mining lease premium, no lease had been issued by Government. On reviewing the case, the Land Officer responsible for the issue of the lease was unwilling to issue due to the uncertain financial position of the company. In the spring of 1957, the Legal Department noted the difficult position the Government found itself in. A premium had been paid but no licence had or could be issued as the company did not meet the necessary financial criteria. It was proposed to return the premium minus the fee that would have been paid if a temporary mining licence had continued during the period, to the value of HK$24,450. A sum of HK$48,600 was refunded to Po Hon Hong Company on the 30th July, 1957. Remnants of the mine operation are still visible to this day. The foundations of the structures can be found in the overgrowth, along with the tailings and mine entrances. The main mine entrance, noted as the 360 Adit, is located at the back of a shallow valley, with an adjacent tailing, and the adit is partially flooded. Further entrances can be found below and above indicating the extent of the workings. The higher level entrances are difficult to reach, the access path having been lost to the scrub, but there are a series of terraces each with a number of entrances, in some of the entrances there is the movement of cool air, suggesting they are connected to the lower levels. 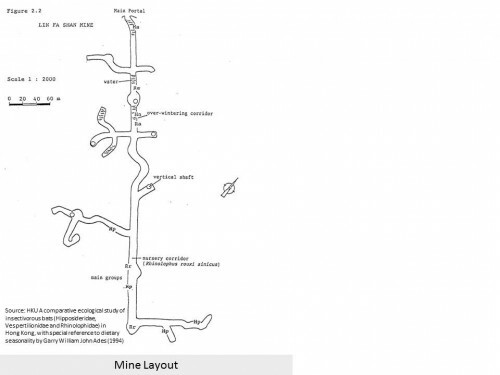 It is likely that ore was mined at the higher levels then dropped down shafts to the 360m level where it would have been removed by hand pushed mine carts. The ore would then have been taken to the processing plant for crushing and washing, separating the wolfram mineral from the rock. In 1994 as part of a bat study, the 360m Adit was explored and the mapped, it was recorded as being 480m long. The site today is remote and difficult to access, a small path threads through the workings. The foundations of the buildings are clearly visible, along with the tailings and the tunnel entrance sits hidden in one corner of the site. 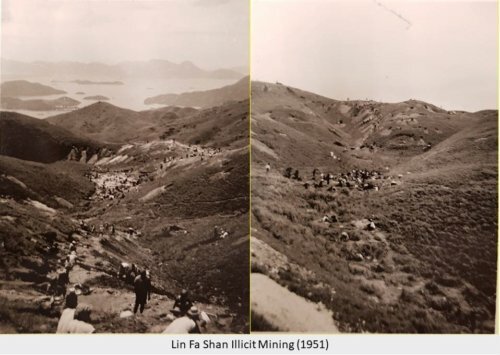 During the summer of 1951, illicit mining operations extended over the hillside of Lin Fa Shan, involving between 3,000 and 5,000 people who lived and worked on the slopes. The miners would extract wolfram from small workings using picks and shovels to extract the spoil, passing the material in baskets, then to be washed and panned for ore. The findings were then taken to the buyers who waited on the hillside, paying HK$10 a catty (0.6kg). This labour intensive operation provided a team of three or four men with an income of HK$30 a day. In addition to the miners, washers and buyers, the operations also attracted hangers-on such as hawkers, and food-venders. One report noted that “‘Home comforts’, i.e. divans, brothels, gambling” were established for the workers. 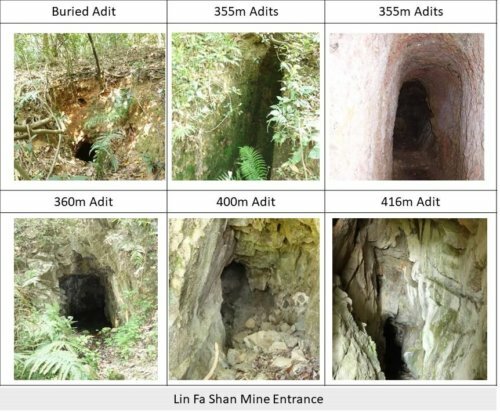 The impact of the illicit mining works was the destruction of forest, grass lands, erosion and pollution of the streams and rivers in the catchment of the Shing Mun Reservoir. Despite the damage the operations were causing, the authorities struggled to identify a law that could be applied to suspend the operations. In August, 1951 it was clear that the Police had limited options other than crowd control and requested that an offence of illicit mining be created to address the situation. In October, 1951, the “Double Tenth” anniversary, National Day of the Republic of China made the operations a political issue. 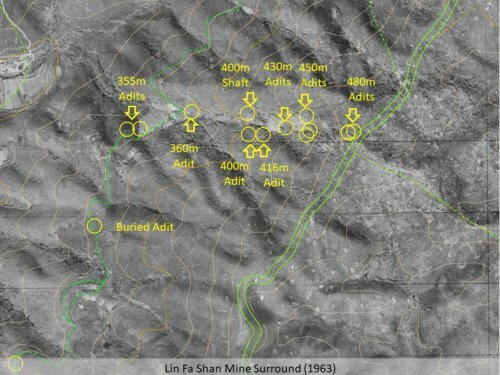 The District Commissioner concluded in a confidential memo of the 13th October “the public may conclude that the reason why we are so openly tolerating illicit mining at Fa Shan is that it is a Nationalist venture”. A twin approach was adopted; with the issue of Temporary Mining Licence 001, Mr O’Neill had to clear and secure his land, removing the miners from the water catchment areas. Under Cap 241, Emergency Regulation Ordinance, the Emergency (Control of Minerals) Regulation, 1951 were published on the 30th November, 1951 to provide some control of the operations. The regulations introduced the concept of authorised buyers and the power to arrest illicit miners. 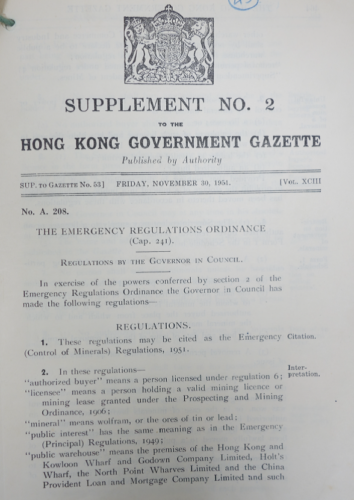 The requirements of the emergency regulations were ultimately incorporated into the new Mining Regulations to be issued in 1954. Ultimately; the illicit mining, later followed by the licenced mine, ceased to be profitable and the business closed as a consequence. Mr Stephen Hui, the mine supervisor continued to operate the Needle Hill mine for a few more years, along with a number mines in China with some success. His mineral and rock collection was donated to the HKU to form the Stephen Hui Geological Museum. This article was first posted on 2nd November 2014 and after being updated by Tymon Mellor again on 28th August 2018. 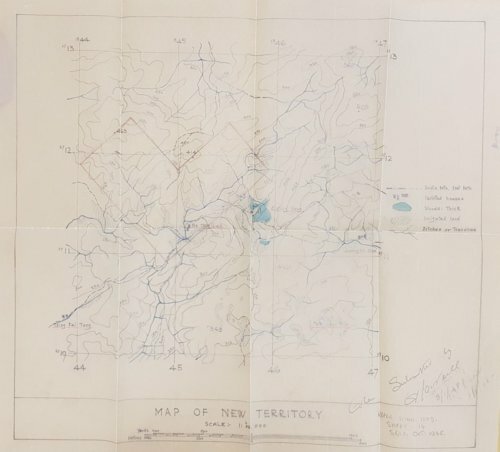 HKRS 156-1-1263 Prospecting Licence, Application from Mr P G O’Neill for a.. The Index contains articles about many Hong Kong mines all of which are linked in the above article.